I hope that's the cover image, for all the reasons people say. The apple definitely looks nervous under the tsunami-like Hokusai wave. It's kind of a strange message reading into that single cover. 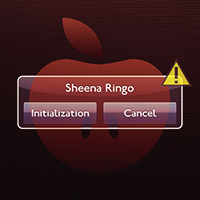 An apple (Ringo's emblem) with bullet holes through it about to be engulfed by a tsunami as the cover for a nationalistic album. Is she happy in life? I wouldn't read too much into the single cover. The bullet holes are just drops of seawater if you compare it to the classic painting that it's referencing. It's not even a physical release of the single. They probably just whipped something up in 5 minutes in Photoshop to put on iTunes. Which is probably 3 minutes more effort than was put into the digital cover for Jiyuu e Michizure. I meant the album cover. That is most definitely the single cover. Whoa. Calm down. It's just some art. Don't start delving into her psyche as a result. Well, to be fair, what you're studying is much different than a random album cover. Art is always subjective, but album covers are a bit different for the most part. Most album covers would be labeled under photography or illustration, though sometimes they're legit paintings. Well, fat chance she'll tell us what it means in her next "revealing" 12-page photo-interview in SWITCH.